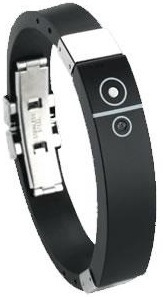 LM959 Bluetooth vibrating bracelet is gadget that will alert the wearer of the bracelet by vibrating. Whenever you get an incoming call the bracelet will alert you by vibrating and if you get away from your phone more than 5m then it will alert you again. So if you are a mobile phone junkie who always wants to keep mobile phone near you then this is the thing for you. Bluetooth bracelet is available for around USD $48, so if you got some extra cash then you can get this. In my personal opinion I would never buy this rather I would prefer the Bluetooth headsets using which we can talk wirelessly. You can buy this from here. Next post: Edible Nokia Phones?